Technically this is a post about dried apricot scones, but it is really a thank you to my mother. You see, my mother loves tea which in turn makes her love things like scones which are perfect with tea. And her love for something as simple as tea and scones meant that she had to share it with my brothers and me. And for those who don’t know my mother, let me be very clear, sharing a love of scones and tea does not involve $15.00 and a trip to Starbucks. Nope, not my mother. To give you an idea of my mother, when I was young, I read and promptly fell in love with The Secret Garden. I thought having a secret garden would be pretty nice and shared that thought with my mother. Not long after that, my brothers and I found ourselves with shovels in hand, digging holes and planting bushes for our very own secret garden. Our little spot in the backyard even had a small fish hole and a bench for reading books. Seriously…when my mother gets an idea, watch out. So it’s not surprising that my mother introduced my brothers and me to scones in the form of a very British high tea. Outside it was a sticky, humid Florida summer day, but inside, as the clock struck 4, we daintily pulled our chairs around the kiddie table and munched on homemade scones while my mother offered us cream and sugar with our tea. To this day, every time I eat a scone, I think about my mother and all the big and little things she did to make my childhood special. And while I’ll never be able to thank her for all the things she has done in her role as my mother, I’ll start with saying thank you for teaching me the joy found in a scone and a simple cup of tea. 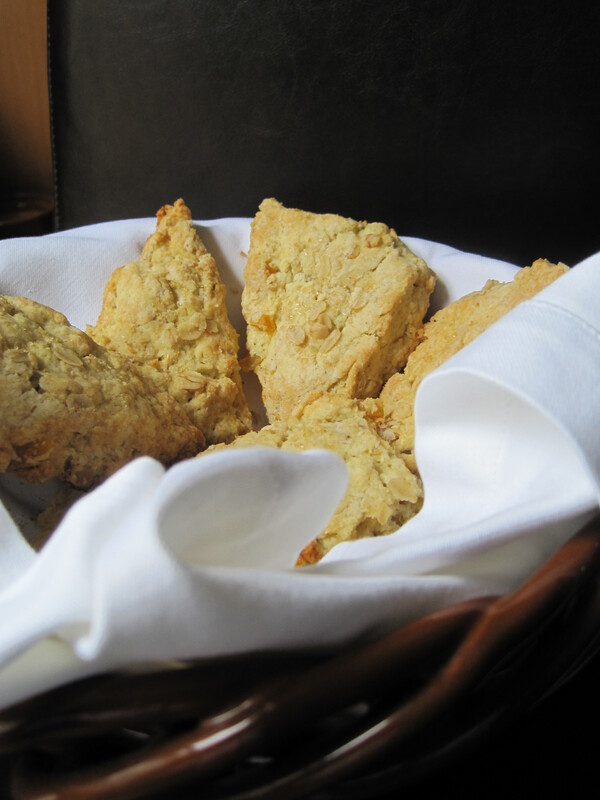 This recipe for dried apricot scones, produces a buttery, biscuit-like scone. 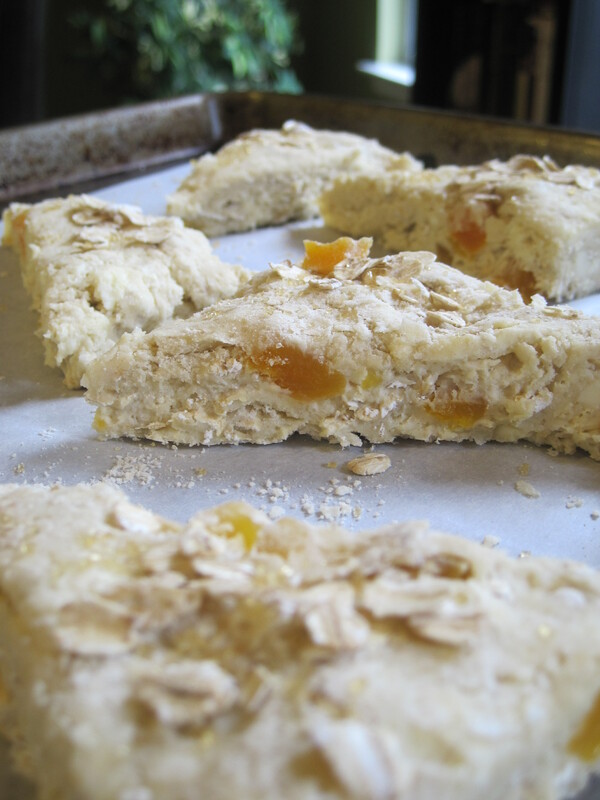 The apricots add a tangy sweetness that cuts the salty, buttery taste of the scone and makes them delicious with a cup of hot tea. While my mother’s scones are more cake-like and usually feature raisins, I think she will approve of this recipe. Adapted from Molly Wizenberg’s recipe for Blueberry Oat Scones in the July 2009 edition of Bon Appétit. Preheat the oven to 350 degrees and place a rack in the top and bottom third of the oven. Line two baking sheets with parchment paper. 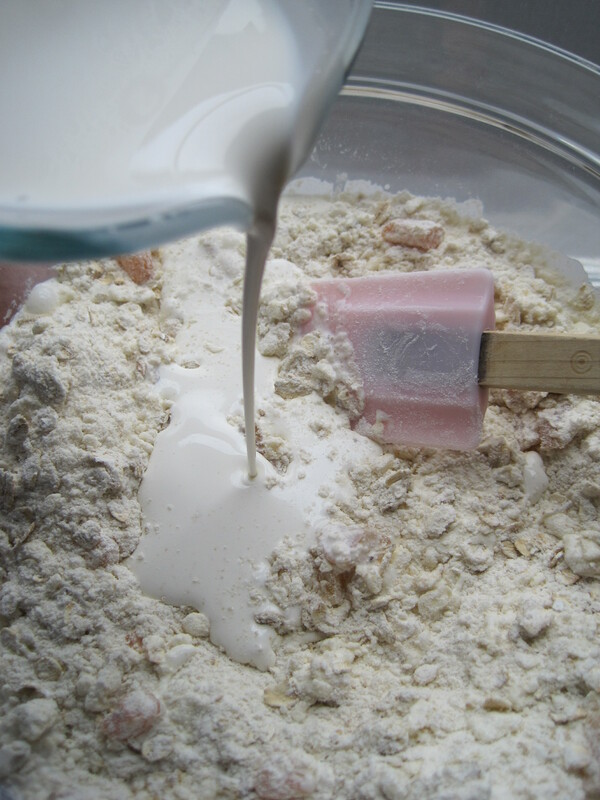 In a large bowl, whisk together the flour, brown sugar, baking powder, baking soda, and salt. 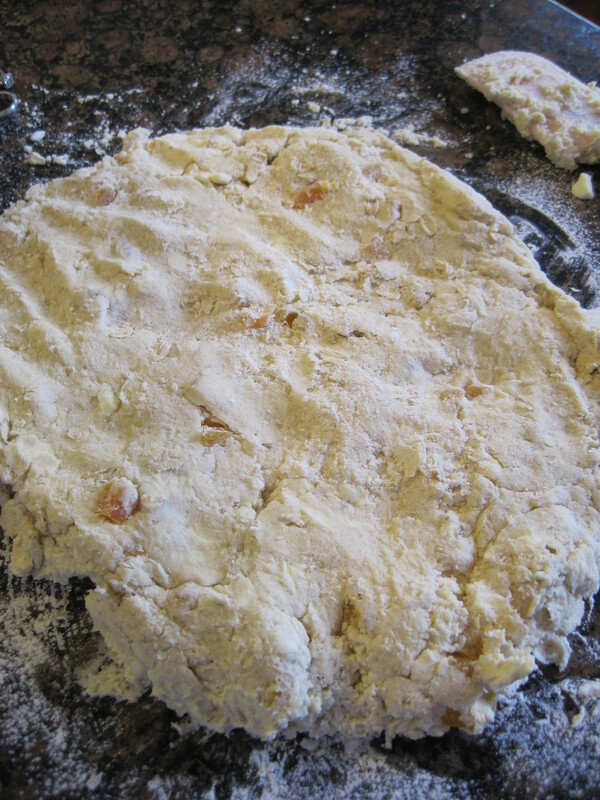 Add the butter to the bowl and use a pastry blender or two forks to cut the butter into the flour until it resembles a coarse meal. Alternatively, use a food processor on the pulse setting to cut in the butter. 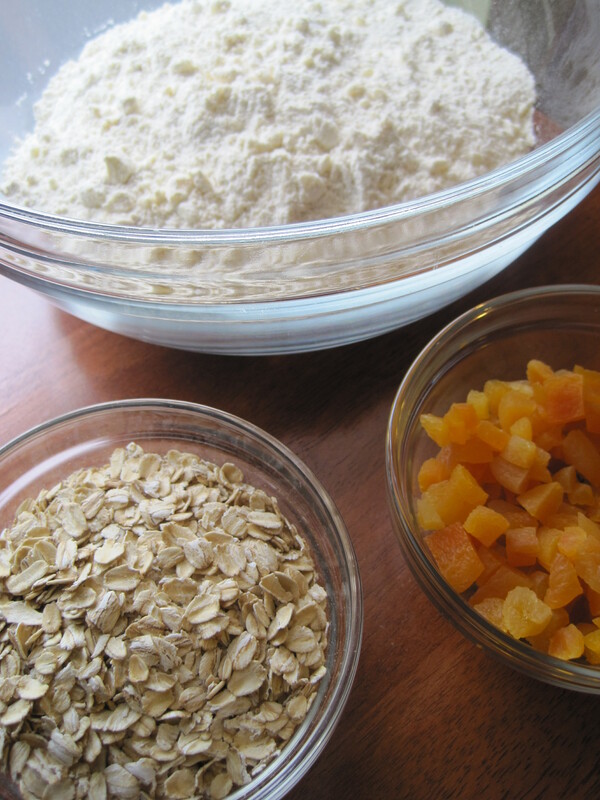 After processing in the food processor, dump the mixture into a large bowl before continuing with the next step. 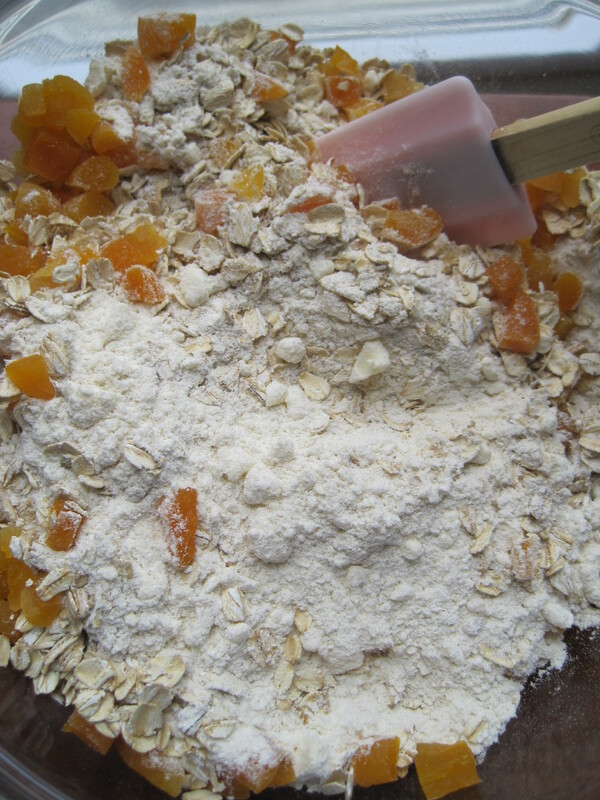 Stir in 1 cup oats and the dried apricots. Slowly add the heavy cream and vanilla extract and stir to combine. When the mixture starts to come together, turn it out on a well-floured counter and pat it into a large square that is about 1-inch thick. 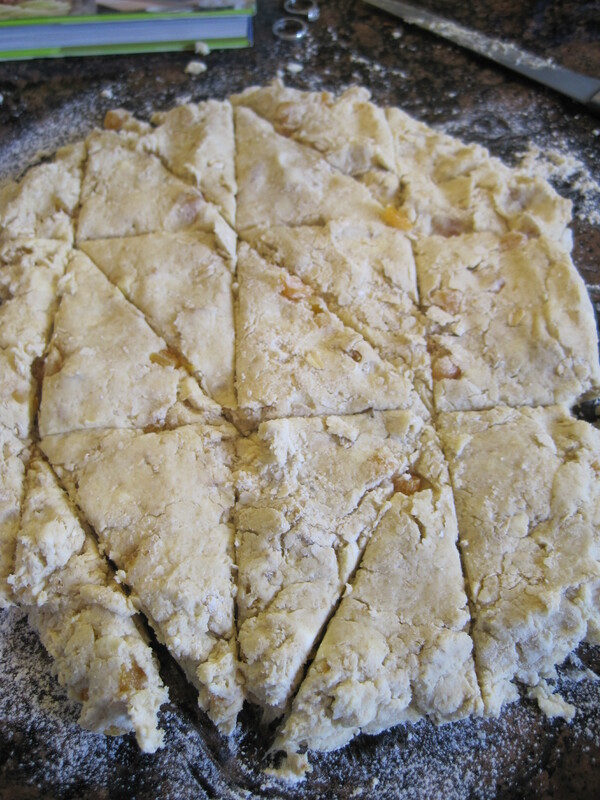 Use a knife to cut the dough into the desired number of triangles and use a thin metal spatula to transfer each dough triangle to the parchment-lined baking sheets. Lightly sprinkle the scones with oats and sugar. Place a baking sheet on each rack and bake for 10 minutes. Switch the baking sheets and bake for another 10 minutes or until a toothpick stuck in the middle of the scones comes out clean. Remove from the oven and let cool briefly on the baking sheets before transferring to a wire rack. Enjoy with a cup of tea and, if you are lucky, your mother. I love to eat scones… usually at Starbucks with my plain coffee. I have never made them and really have had no interest as I thought they must be only something tea drinkers could make. Great recipe and delightful writing about your mom. I guess I will now try to make them myself and it gives me a reason to also think of your mother! I am delighted to have found this site-quite by accident. I will become a regular as Iam once again venturing into the kitchen,cooking for 2 after an absence from this task. I hope to turn the task of cooking into a joy again! I am so proud of you!! I love scones, and yours look very gooood!